Large-scale solar projects are heading into yet another sea change: the 1,500-volt PV system (Vdc). 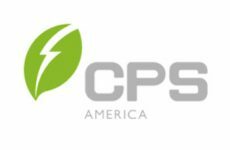 The idea behind the voltage increase is the same now as it was during the move from 600 volts to 1,000 volts — further reduce installation costs and increase profitability by reducing the number of inverters and other BOS components required. Kanczuzewski relays his experience designing projects with Schneider Electric’s new Conext SmartGen 1,500-Vdc inverters, which can record and store operations and service history, as well as upload all of this data and self-diagnostics to the cloud. And this is just the beginning as all of your favorite inverter brands start to launch and ramp up production on their product lines. 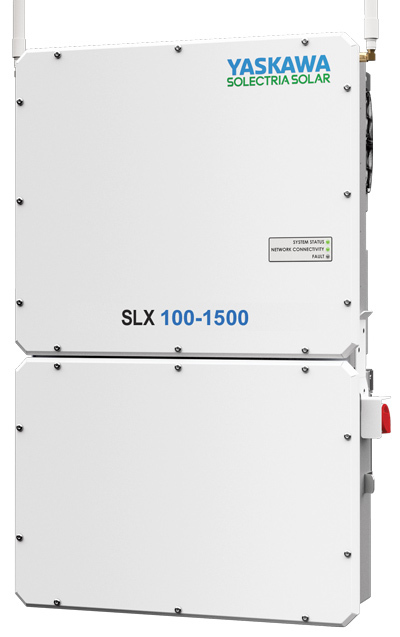 At the 2016 Solar Power International, Yaskawa-Solectria Solar, one of the most widely installed brands, pre-announced its 1,500-Vdc, utility-scale string inverter, the SLX 1500 line. These inverters will be available at various power levels and AC voltages, but adding in its Wireless Mesh network eliminates the need for communication wiring, reducing communications and BOS cost. “In addition, the Wireless Mesh proves to simplify commissioning, has robust/secure networking, advanced grid functionality, superior asset management and improves response time,” says Natalie Holtgrefe, senior marketing manager for Yaskawa-Solectria Solar. Regardless of ancillary benefits, being an early adopter to such a step up in voltage carries risk. “There is a lack of understanding in the industry concerning incident energy and arc flash risk. This is true for 1,000-Vdc systems and clearly becomes more important in 1,500-Vdc systems,” says SolarBOS CTO Coel Schumacher. 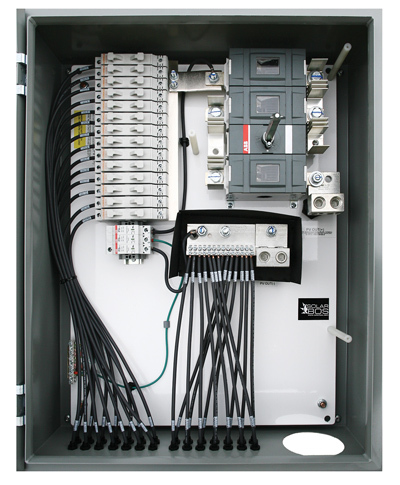 BOS equipment provides overcurrent protection and disconnecting means used for system operation and maintenance and must be accessible to personnel. Due to the nature of photovoltaic installations, there are a significant number of sources that aggregate in BOS equipment, and a series of devices are typically used to achieve this. SolarBOS offers BOS equipment including combiners and recombiners with various options for circuit count, current ratings, OCPD and disconnecting means. 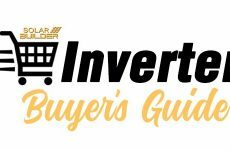 On the AC side of the inverter, SolarBOS offers configurable switchgear that is necessary for string inverter implementation. 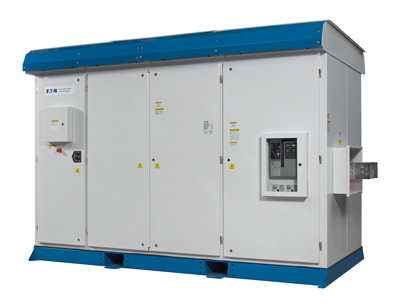 Yaskawa-Solectria Solar’s DISCOM 1500 string combiners offer various options that make design and safety easier for installers, including MC4/H4 connectorized wire whips, compression lug studs and heavy gauge bus bars. Eaton, which has extensive experience in managing DC circuits in other high voltage DC environments such as battery storage systems, rail systems and steel mills, reminds us that the call for 1,500-volt safety extends to the equipment, too. Eaton’s 1,500-Vdc inverters will employ a new proprietary DC design concept that replaces manual DC disconnects with DC contactors to improve both control and enhance operator safety. As dazzling as the new capabilities are, the potential BOS cost reductions are just as enticing for an industry constantly having to prove its economic worth. GTM Research estimates that overall project costs can be reduced by three to five percent by moving to 1,500-Vdc systems, realized mainly through reduced installation time and fewer components. SolarBOS’s Schumacher says the 1,500-Vdc projects they’ve done are acting as flagship installations to prove the benefits of higher voltage systems. In general, he says, BOS equipment becomes more energy dense and cost effective at 1,500 Vdc. “In addition 1,500-Vdc systems lend themselves to higher AC voltages [600 Vac or more], which helps to reduce AC conductor and switchgear cost,” Schumacher says. Eaton developed its Crouse-Hinds series DC collection system, Sunnector, to reduce costs and installation time in these utility-scale solar projects. This system can help reduce labor and material costs by 15 percent on average, according to Vernacchia, in 5 MW and larger-scale, grid-tied solar projects that use fixed-tilt ground-mount racking designs. A key here is using aluminum for long-distance runs, but still incorporating copper connections to the PV modules. 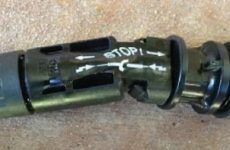 This way contractors are able to use standard copper connectivity and tools, while project owners are able to reduce costs by taking advantage of lower cost aluminum wire. Yaskawa-Solectria’s SLX 1500 line and Wireless Mesh network eliminates the need for communication wiring, reducing communications and BOS cost. Holtgrefe says Yaskawa-Solectria Solar is seeing considerable demand for 1,500 Vdc in utility-scale projects. However, 95 percent of demand in the C&I space is still for 1,000-Vdc products. Her expectation is for the C&I space to move toward 1,500-Vdc systems at a slower rate of adoption than utility-scale. “We’ll need to educate our customers about this new offering and help them understand the value,” Kanczuzewski says. “Code standards will need to be revised in some areas, and different utilities may have their own guidelines, so installers will need to make sure that 1,500 Vdc is compliant or show how 1,500 Vdc is becoming the new standard. We can always go back to 1,000-Vdc systems if our customers require it, but we hope we’ll be able to transition quickly.